Louisa County has the infrastructure to allow many types of businesses to take advantage of a strategic geographic location. Three Interstate Highways serve or are in close proximity to Louisa. I-64 is an east-west Interstate that connects the Port of Hampton Roads, through Louisa County, with major cities to the west such as Charleston, Louisville and St. Louis. 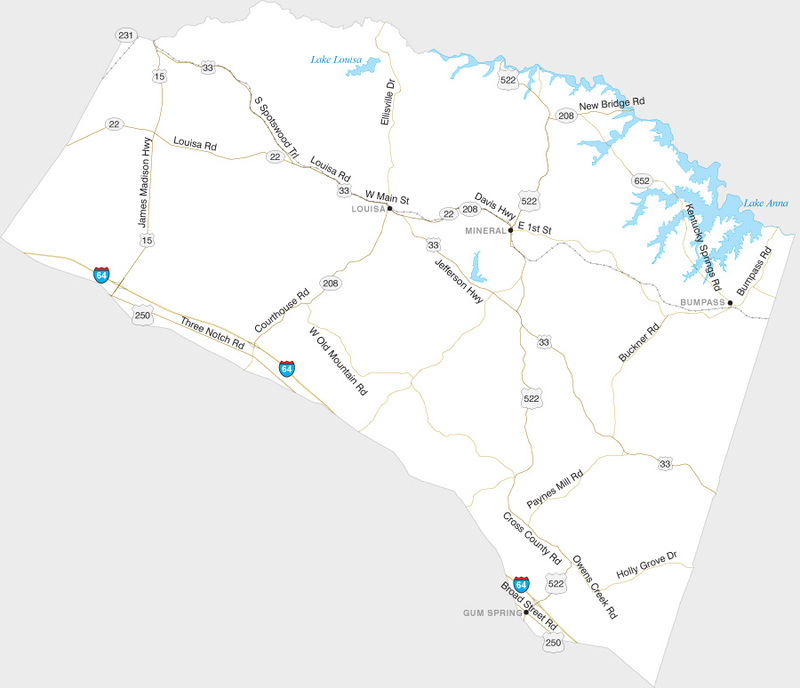 I-81 is a north-south Interstate located 45 miles west of Louisa, via I-64 and connects the area with cities to the north and those to the south and southwest. I-95 is a north-south interstate located 55 miles east of Louisa, via I-64, that connects New England with the Deep South, running from north of Boston to south of Miami. U. S. Route 29,15, 522 & 250 are major north-south, east-west primary highways that serve cities north of Louisa through Washington DC and those south of Louisa, connecting with Interstate 40 in North Carolina. 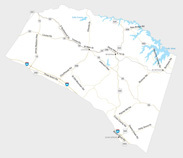 The Louisa County Airport/Freeman Field (LKU) is owned and operated by the Industrial Development Authority of Louisa County, an independent authority created by the County of Louisa. The airport was constructed in 1987 and has since been incrementally developed to address the economic needs of Louisa County and support the businesses and industries located in the County and the adjacent airpark. Rear Admiral Dewitt Freeman (Ret.) was instrumental in the creation of Louisa County Airport/Freeman Field and was honored when the airport’s name bestows his legacy. The runway is 4300’ X 100’ which upgraded the FAA Airport Classification Code (ARC) to B-11. This classification allows LKU to accommodate a full range of private aircraft and corporate fleets. The pavement strength was designed to accommodate a 12,500 aircraft with a single gear configuration. The runway will be completely overlaid with asphalt in 2012. LKU has a localizer (LKU-108.55 MHz) and an Automated Weather Observation System (AWOS III-119.475 MHz). Nighttime operations on runway 27-9 are supported by a constant current Medium Intensity System (MIRL). Two Box, Precision Approach Path Indicators (PAPI’S) are installed on both runway 9 and 27 as are Runway End Identifier Lights (REILS). A rotating beacon is installed on the water tower serving the industrial park. Charlottesville-Albemarle Regional Airport (CHO) provides commercial service with direct non-stop flights to Washington Dulles, New York, Atlanta, Charlotte, Cincinnati, Detroit, Chicago and Philadelphia. Dulles, with direct non-stop service to west coast cities and major cities around the world, is a half hour drive from Louisa County. Louisa County is well served by high-speed communication capacity. AT&T, Verizon, CenturyLink and CVALink all have major points of presence (POPS) throughout the area. Buckingham Branch Railroad (BBR) leases the short line from CSX that runs from Doswell (Near Richmond), Virginia to Clifton Forge (Virginia/West Virginia Line), Virginia. The BBR short line spans the entire length of Louisa County from east to west, providing several large tracks of rail served sites for industrial development. Both Norfolk Southern and CSX rail lines serve the region. One of the main lines of the Norfolk Southern runs from New Orleans, through Charlottesville, to Washington DC and beyond. CSX rail lines traverse the region from the Port of Hampton Roads to the Midwest and from Washington DC, through Charlottesville, to Chicago. Amtrak offers passenger rail service over the Norfolk Southern with daily service from New York to New Orleans, through Washington DC and Charlottesville, and from Washington DC, through Charlottesville, to Chicago three times a week over CSX.